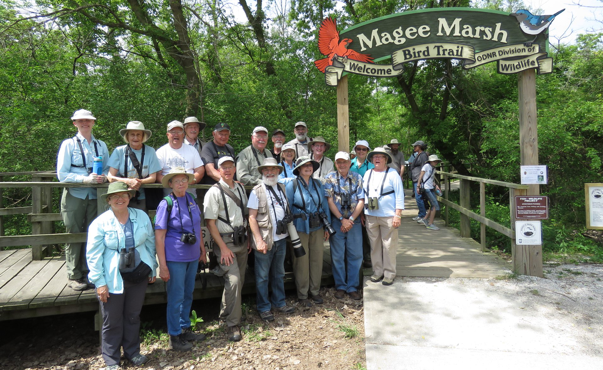 Wichita Audubon visited Magee Marsh in NW Ohio, the "Warbler Capital of the World", so named due to the large number of warblers and other spring migrants that stack up along the Lake Erie shoreline to fuel up before setting off over the lake. We timed our visit, May 14-17, to start at the end of the big birding festival there so as to avoid some of the crowds. From a birding standpoint our timing turned out to be perfect. Our group trip list was 149 species in Ohio that included 30 species of warblers. We also included an extension into Michigan to see the Kirtland's Warbler, which brought the trip list up to 164 species and 33 species of warblers. An impressive tally of warblers! Leader: Kevin Groeneweg Participants: Doris Burnett, Dennice Craig, Sharon & John Dilks, Tom Ewert, Harry Gregory, Susan Hammer, Bill Langley, Sam & Terry Mannell, Jim & Patty Marlett, Cheryl Miller, Ernie Misek, Jay & Marcia Newton, Sandra Tholen, Rod Wedel.